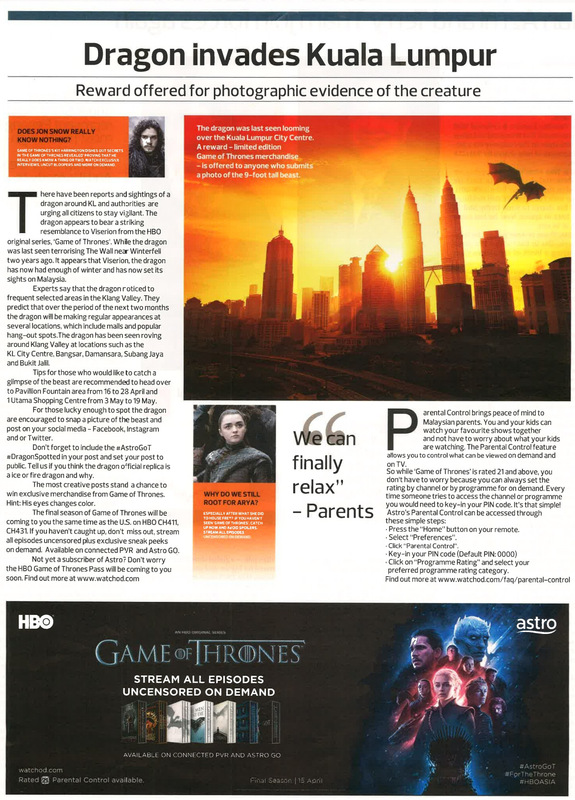 If you've been on social media this week (especially on Monday), you'll notice that the talk of the town is that dragons have been spotted soaring the skies of Kuala Lumpur. 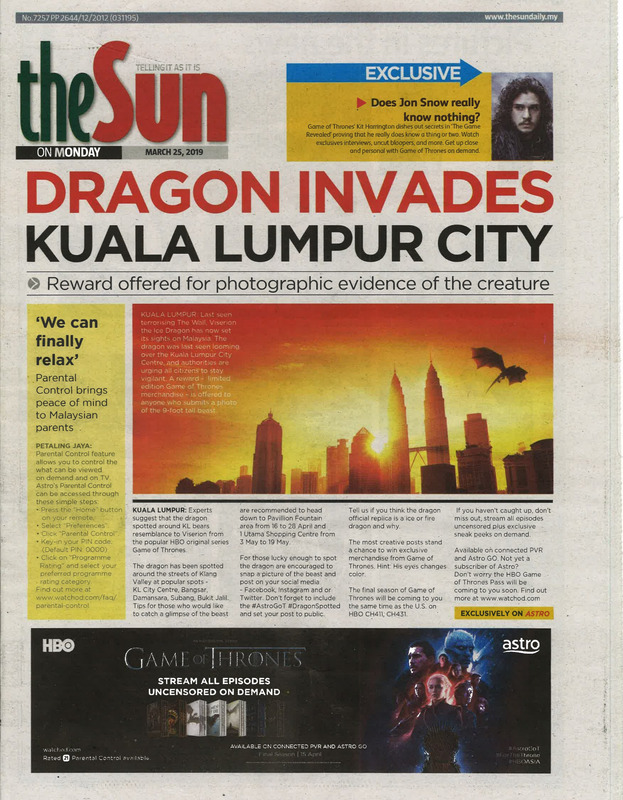 According to eyewitnesses, the dragon was spotted at several popular locations in the Klang Valley such as Bangsar, Damansara and Subang Jaya, to name a few. What the hell is going on, you ask? Since when are dragons real? Does that mean unicorns are real too? Well, to answer your question, they are real since Game Of Thrones Season 8 will be invading your TV screen starting 15 April. Yup, that's right: the final season of the highly-acclaimed series will be coming to you the same time as the United States on HBO (Astro Ch 411, 431). Here's the best part: the episodes will be uncensored! Okay, back to the dragons. 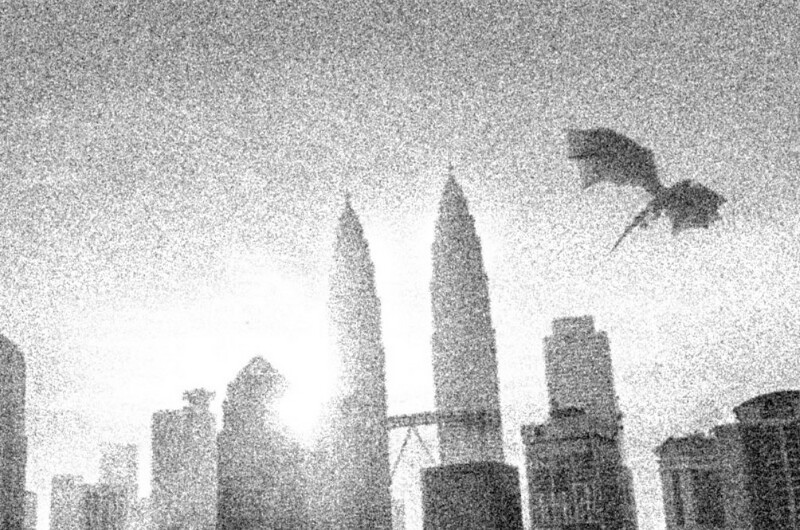 Unfortunately, the dragon in the pictures above are not real (sorry, Khaleesi), however, there will be a giant dragon roaming the streets of KL starting 5 April. We don't know what the dragon looks like, but we've been told that it's huge and it's impossible for you to miss it. If you're lucky enough to catch a glimpse of the dragon, immediately snap a picture of it and upload it onto your social media pages with the hashtags #AstroGoT and #DragonSpotted. For your trouble, you'll walk away with some exclusive money-can't-buy 'Game Of Thrones' merchandise. Sounds interesting, right? Because we love you guys so much (cheh! ), we're going to help you out: we've managed to get a hold of the locations where the dragon is going to be! What are you waiting for guys? It's time to grab some friends and go dragon-hunting because winter is here! Wait A Minute, Are These The New PDRM Patrol Cars? Adakah Makanan Di Family Mart Benar-Benar Halal? Ini Penjelasannya!